Our on-site mill trials consist of our representatives coming on-site to your mill and conducting trials which do not interrupt production. 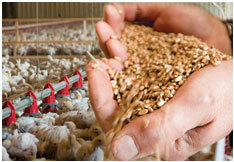 We will look at all the factors that affect feed quality in the mill, not just pellet binders. During our mill trials we ensure that mill controls are not changed, so that the conditions are in fact representative of the daily setting within the mill. Cra-Vac Industries Inc. offers on-site guidance and troubleshooting. Occasionally a feed manufacturer will have a pellet quality issue they cannot solve, so they come to us for help. In turn, we provide them with a mill-audit, and a corrective action plan. We have never failed to identify a problem as of yet. Following your on-site mill trial, you will be presented with results. Two reports will be created: The Current Conditions Report (outlining the mills current situation), and The Corrective Action Report (outlining Cra-Vac's recommendations). The results will include the benefits of implicating suggested changes and a calculation comparing the costs of corrective action against the financial benefits of making changes.